Perry the Titan Arum to Bloom Soon! 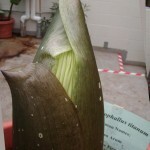 This afternoon, July 4, 2010, the spathe of Perry’s inflorescence was revealed. The lettuce-like appearance shows that this will be an inflorescence. 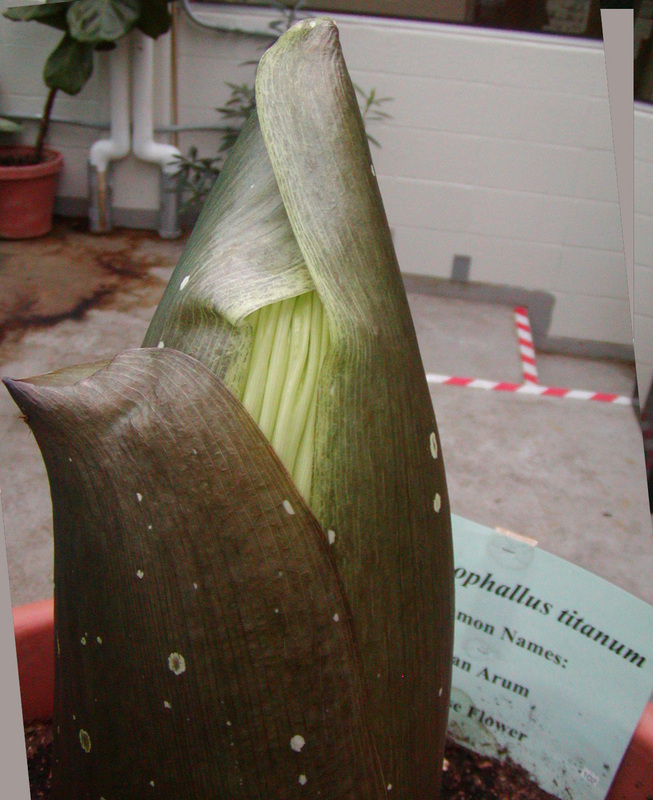 The first sight of the spathe on Perry the last time was on the evening of April 26, 2007, and the inflorescence began to open on the afternoon of May 12. It was fully open for Mother’s Day, May 13. This could mean that, since the spathe appeared for the first time this afternoon, we might be looking at an opening about 16 days from now – July 20 or thereabout. This is going faster than I had thought – perhaps the warmer temperatures have sped it up. I looked at the webcam this morning, and no spathe was apparent. A look about 2 1/2 hours ago showed the distinct lettuce-like pattern of the spathe. I can now hear fireworks going off in the distance. Those are probably not for celebration of the appearance of the spathe, but it’s a nice coincidence.